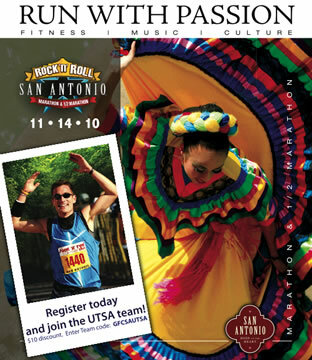 (Aug. 11, 2010)--UTSA faculty and staff members are invited to join the UTSA team participating in the Rock 'n Roll San Antonio Marathon and Half Marathon on Sunday, Nov. 14. Those new to running shouldn't be afraid to join up -- it's an opportunity to lose a few pounds and gain a few muscles -- and there will be a coach and custom training. Sponsored by the UTSA Wellness pilot program, UTSA participants can save $10 if they register by Aug. 31. They will receive complimentary online training including a custom training program, weekly trips and training logs courtesy of race sponsors. Additionally, the UTSA Wellness pilot program will provide a running coach to assess, encourage, motivate and run with the team. There will be weekly Saturday morning group runs to prepare for running or walking/running the half marathon. Register at the Rock 'n roll San Antonio Marathon and Half Marathon website, by fax at 858-450-6905 or by mail to Rock 'n Roll San Antonio, Attn: Registration, 9401 Waples St., Suite 150, San Diego, Calif. 92101. >> Learn about 2010 running coach Joseph Barber; training, commitment, nutrition and preparation; and online training options at www.ironmanjoefitness.com. To receive the UTSA $10 registration fee discount, enter the code "GFCSAUTSA." Both marathons will begin at 7:30 a.m. on race day; participants must arrive by 6:30 a.m. The half marathon will last up to 4.5 hours. For more information, call Kristee Phelps, UTSA wellness coordinator, at 210- 458-6102 or e-mail wellness@utsa.edu.